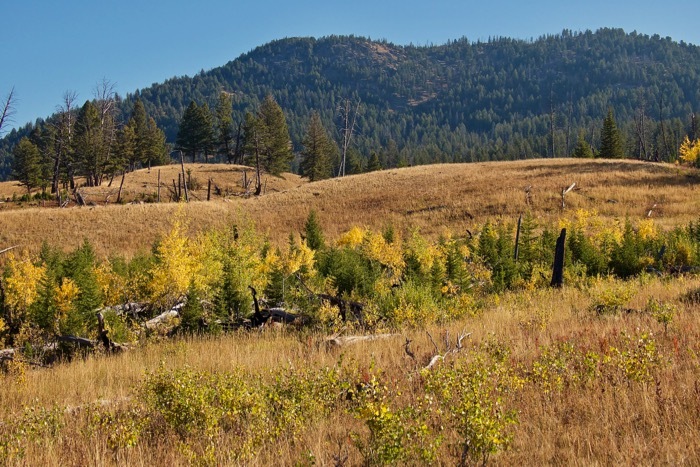 The wilds of Northern Yellowstone include a great diversity of trails and habitats. 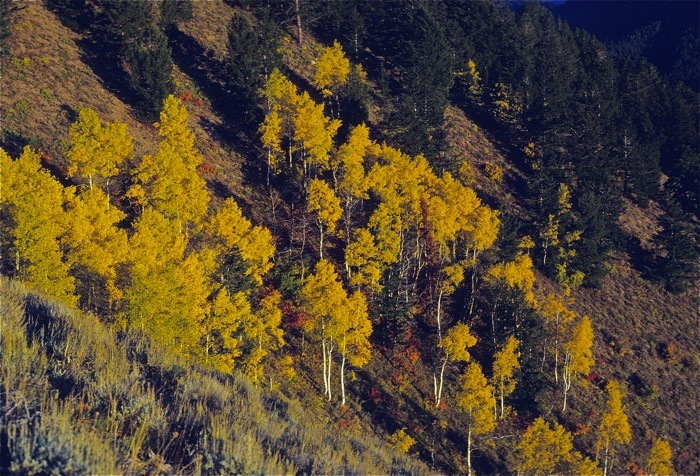 Although some of this trip often overlaps with our June Northern Yellowstone trek, it is a different world in the autumn! 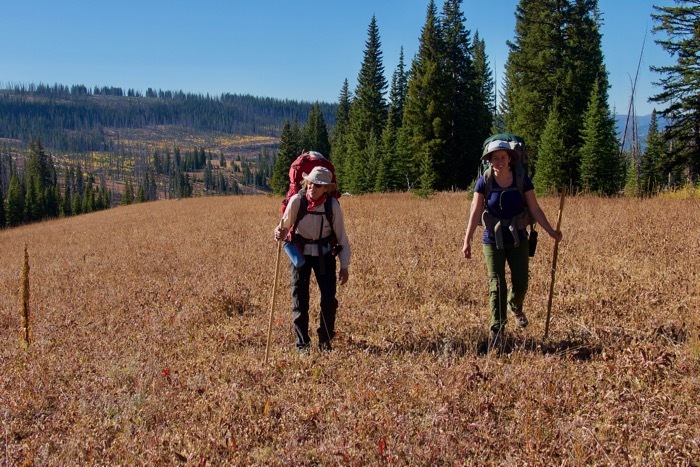 Our fall route often includes the high, wild and wonderful Buffalo Plateau, a subalpine wonderland with great views, big meadows and verdant forest. The elk rut will be at its peak with bugling bulls, plus there are bears, bison and most other typical species of Yellowstone wildlife. Willows and on some of the routes groves of quaking aspen will be starting to turn glorious gold, and the nearby peaks of the Montana Absaroka Range may be covered with early autumn snow. This is a truly magical season to be in the Yellowstone wilds! We rate this trip fairly strenuous, and its base is Gardiner, Montana. We vary the route from year to year depending upon conditions. September weather is usually great, with mild days and frosty mornings. However, prepare for cold wet weather just in case, by carefully following our Clothing and Personal Gear List. In the event of a major storm situation, we many decide to move the trip to a lower elevation route in the same general area of the park, though again, September weather is usually great. Some years, a small portion of the trek will be in the million-acre Absaroka-Beartooth Wilderness, which is contiguous with the northern backcountry of Yellowstone. TREK BASE: Gardiner, Montana: Comfort Inn, Route 89 Gardiner MT, phone (406)848-7536; gm.mt411@choicehotels.com. Mention that you are a Big Wild client for a 10% discount. If you need a night in Bozeman, we recommend the Bozeman Comfort Inn at 800-587-3833 or 406-587-2322. MEETING TIME: Pre-trip orientation including food and gear handout plus safety talk at 6 pm at Absaroka Lodge, the evening prior to day one of the trip. TREK RATING: This trip is fairly strenuous, with some off-trail. The longest backpacking day is about 9 miles, usually with one layover. Total mileage not including day hikes: 30-35 depending upon route options. ELEVATIONS: 5500-8500 feet with optional layover day hikes. Maximum on day elevation gain with backpack is usually about 1800 feet depending upon which route we choose. WEATHER: Usually pretty stable with warm sun and frosty nights. Afternoon showers are less common than in the summer. Expect anything possible from snow to 75-degree afternoons. However, the occasional early autumn snowstorm (or cold rain) means that we must be prepared, just in case. Visit the National Weather Service for a forecast of the area. FISHING: There is stream fishing on most of our routes, but native cutthroat trout are “catch and release” only. A license can be obtained in the park. SPECIAL FEATURES: Wide open spaces with great views transitioning into beautiful coniferous forest broken by mountain meadows and scattered stands of autumn gold willow and/or quaking aspen. Autumn snow (many years) on the peaks. Roaring streams and rivers. It is great wildlife habitat and the elk are bugling. The upper valley of Hellroaring Creek is magnificent! So is Cache Creek if we choose that route. And the Buffalo Plateau, another feature that we rarely visit on the June trip, is a really wild and a relatively unknown enclave of the Yellowstone Backcountry. You’ll be in real wilderness as soon as we leave the trailhead. ITINERARY: There is usually one layover, and we’ll do either a loop or “point A to point B”. Campsites are reserved in advance just for our group, and the trailhead is only a half hour drive from Gardiner.